Among these model, the DJI Phantom 3 4K crowns the first position with all its latest technology and features. This is suitable for the aerial photographers and videographers who require high-quality 4K video capabilities. phantom3 4k can be widely used in wedding photography, videography and the camera quality of this drone are 12 megapixels which give the crisper and clearer picture quality. You can get the DJI Phantom 3 4K Drone Reviews along with Features and specifications here. Let’s see the detailed explanation of DJI Phantom 3 series in the following section. And check out the DJI Phantom 3 4K Camera Drone Price history for last one month. DJI is a Chinese company established in 2006, and it is a leading manufacturer of drones. The DJI company provides its services in different countries. The headquarters of DJI is located in Shenzhen which is widely considered as China’s Silicon Valley. Starting as a small office in 2006 it became a giant global workforce. The company has worldwide branches in U.S, Netherlands, Japan, Germany, Beijing and Hong Kong. The DJI company builds on the ethos of “form follows function.” The DJI systematically releases the latest drones with updated technology. Coming to the DJI Phantom 3 Professional, It is available from 7 April 2015, and it is the first Phantom 3 model released by DJI. It is highly suitable for Aerial videographers who require high-quality UHD 4K video capabilities. The Camera quality of this drone is 12 Megapixels, and it captures the crystal clear pictures cleaner and faster than ever. Enjoy the live HD view Simply connect your phone or tablet, and a 720p HD view of everything your camera sees as you fly is displayed live. The maximum flight time of this drone is about 23 minutes, and the video transmission rate is upto UHD 4K/30fps. The other model released by DJI series is DJI Phantom 3 Advanced; It was also released on April 7, 2015, along with the Phantom 3 professional. DJI Phantom 3 Advanced is best Arieal Photography Drone 2019 recommended for the aerial photographers who need an aircraft with an extended range and live HD view. The only difference between DJI Phantom three professional and DJI Phantom three advanced is the video transmission rate. The phantom three advanced has a transmission rate up to 2.7 k/ 30fps. The flight time of this quadcopter is 23 minutes, and the maximum fly range is 6000m which is similar to Phantom three professional. It can be operated in the temperatures between 0°C to 40°C. On moving to the Phantom3 Standard Quadcopter, It is available from August 5, 2015. This is suitable for the beginners who thoroughly wanted to enjoy the first flying experience. Beginners who require a ready-to-fly, affordable aerial platform with Intelligent Flight modes can obviously choose this phantom three standard quadcopters. The significant difference between the Phantom 3 Standard and the Phantom three professional is the flight time. The flight time of DJI Phantom three standard is 25 minutes, and the fly range is 6000 meters. The outdoor positional module uses GPS technology. The latest model of DJI series is the DJI Phantom3 4k, It is available from 4 January 2016, DJI Phantom 3 4K combines the best from previous Phantom models, and the gives the excellent features of more advanced models at a very reasonable price.The flight time of this DJI phantom 3 4k is 25 minutes, and the fly range is 6000 meters. It is easy to fly drone and additionally, you can access intelligent flight control features like Follow Me, Course Lock, Home Lock control, and waypoint navigation. It’s a Ready to fly drone, and no installations are required, just adjust the propellers and charge the battery and make sure whether you have inserted fully charged battery are not. Easy to fly, even a beginner can quickly fly the drone due to its flexible accessibility. The maximum fly time of the DJI Phantom 3 4k is 25 minutes, and the flight range is 6000 meters. The DJI Phantom 3 Quadcopter is suitable for the outdoor flying as it has the latest technologies like outdoor positioning module, vision sensing, and greater flying range. Phantom 3 DJI 4k has a high-definition camera, i.e., 12 megapixels So; we can capture the clear and quality pictures. DJI Phantom 3 4k is also an app-controlled drone just install the DJI GO app and link your mobile device to the phantom via DJI GO app. So, Finally, we can say that this drone is suitable for the enthusiastic photographers and nature lovers for capturing aerial photography and HD filmmaking due to its extraordinary camera attributes. The DJI drone is equipped with the built-in integrated 12MP DJI camera Drone attached to a 3-axis gimbal. Apart from 12MP JPEG or RAW photos, the camera can record cinema-spec DCI 4K, i.e., (4096 x 2160) at 24 fps and UDH 4K (3840 x 2160) at 30 fps. Unlike RC quadcopters, Phantom 3 has an advanced feature i.e. built-in GPS. This Built-in GPS provides two types of functionalities such as the drone automatically reaches its home location. You need to set the start position. Therefore, if the connection is lost the drone automatically reaches its home point. The other is GPS telemetry makes the quadcopter more stable even in heavy winds at high altitudes. Hover mode is also an advanced feature. If you find there is heavy wind, the you can turn on the hover mode. So that the flight will come to its home location even in heavy winds. The Phantom 3 4k uses Intelligent Flight batteries, which check the health of its each and every individual cell with the help of the DJI Go app. This indicates that the old batteries won’t work. DJI claims the flight times upto 25 minutes. But in my personal test the phantom 3 DJI lasted 25 minutes with hovering and flying in the wind and factoring in time for takeoff. Landing can be done automatically through the DJI Go app. The DJI Phantom 3 4k has an upgraded remote control which comes with a lot of features. In this Remote controller, we provide a gimbal control dial, trainer port, rechargeable battery, LED indicators, throttle locking element ans smartphone case. DJI’s Intelligent Flight features include the waypoint navigation, point of interest flight planning and Follow Me function. TheWaypoint navigation allows you to set up a multipoint path for the drone to follow while you control the camera, while POI flight planning allows you to fly a circle a subject, keeping it centered. Follow Me sets the drone to track the movement based on your orientation when holding the remote controller. A unique Beginner Mode helps us to learn how to fly in a safe and limited area for the first flight and gives us hands on experience. DJI Phantom 3 is a Ready to fly drone, and no major installations are required. Just follow these simple instructions. First of all, Remove the Gimbal Clamp, we can remove the gimbal clamp by sliding it to the right. The next step is attaching the Propellers, fix the propellers to motors with black axes and spin counter-clockwise to secure. Mount the propellers with silver dots with silver axes and spin clockwise to secure. To install the Battery, Slide battery into the battery compartment. Make sure that you hear a click sound indicates the battery is firmly installed and your drone is now Ready to fly. Before Flying, fully charge both the Remote Control and the aircraft battery. Preparing the Remote Controller, Tilt the mobile device holder to the desired position, then adjust the antennas. Then, press the button on the top right side of the mobile device holder to release the clamp, then tighten the clamp to fit the size of your mobile device. Flight Controller, The phantom 3 DJI 4K flight controller, features several important upgrades, like new flight mode. Safety modes include Return-to-Home. It ensures a safe return of your aircraft when the control signal is lost. To update the firmware, you must use the DJI GO app. Download the latest version of the DJI GO app from play store and app store. Then, connect the WiFi to the device. It will appear as a wireless network with Phantom. It will ask you to connect the aircraft, so turn it on. Once it is connected, it will say you must “Activate” the plane. Then start the drone and enjoy flying. Propellers intrude into the footage. Battery requires approximately an hour for full charging. Requires Android, iOS device for connection. Place the Phantom 3 DJI away from children. Keep your stuff away from circulating rotors. Don’t fly the Phantom 3 DJI in the crowded places. They should not be fly over any accessible areas such as beaches, densely populated parks, etc. Minimum age to operate this phantom 3 DJI is above 13 and adult supervision is recommended. Never use your phantom 3 DJI battery in any other drones. Follow the guidelines and enjoy the joy of flying. Phantom 3 DJI warranty depends on the individual parts, which range from 3 months to a year. DJI does not provide the assurance to some parts like frame and propellers. For more details about warranty contact DJI customer service center. DJI Drone 4K User Manual. Phantom 3 DJI 4K Quick Start Guide. DJI Phantom 3 Safety Guidelines and Disclaimer. Phantom Intelligent Flight Battery Safety Guidelines. I recommend you to have a glance on the disclaimer before you fly. Prepare for your first flight by reviewing the Phantom 3 DJI 4K Quick Start Guide and the User Manual for more information. A must buy for this price! I have been using this drone for a little while now, and I love everything about it! This is my 4th drone I’ve owned, and it blows every other one I have away. The DJI camera is fantastic; I have blown away when I saw that it could record true 4K and not just the downscaled 3840 x 2160 version. It is so similar to the Phantom 3 professional that everyone who sees it thinks it is, I just wish it had the long range, but for the price of $ 599 this is a must buy. I have seen a little bit of lag on the video transmission, but I think if I buy the USB port module for the controller it might fix that cause then I wouldn’t be using wifi. Altogether this is a fantastic product. Stacks up in Extreme Conditions! The Phantom 3 DJI offer very intuitive control (though it is sensitive, so make gentle adjustments). The quality of this 4k video camera is professional quality, especially when coupled with a set of filters. I was particularly impressed with the quality of the gyro stabilization to produce steady video results even in the wind (although using the drone in high wind is not recommended). We used this unit on an expedition in the Arctic where equipment failure is a common occurrence. This is not the case with this state of the art tool; I HIGHLY recommend it! What can i say? DJI made another amazing drone. I have had this drone for about six months, and it is amazing. I have used it for a couple of short films of mine, and it is a 10/10, the drone camera is fantastic, up to 4k 30 fps. The drone is very responsive and moves even if you touch the control sticks a little, this is the best drone for someone that wants to get into drone flying but also wants a fantastic camera but doesn’t wanna spend a fortune on one. I would recommend this to a friend. So, Finally, The Phantom 3 DJI 4K is even recommended for the beginners with it’s easy to fly and Ready to fly capabilities. 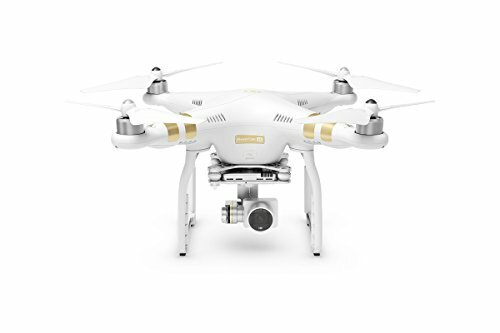 It captures stable HD images(12 MegaPixels), ultra high-definition videos from the air and includes all of the safety features you expect from a DJI drone with a very reasonable and affordable price.